I fought at my first Dog Brothers Gathering! This is my AAR (After Action Report) of my first ever Dog Brothers Gathering. Many people who train the martial arts don't train stickfighting with minimal protection. For those that do train stickfighting, many don't fight at a Dog Brothers Gathering. And I'm guessing there are few people in their 50's with ~2 years of training going to a Gathering and might I add that the Gathering was in a different country to boot! I did all that ... WOW! And 5 fights (2 minutes each) ... I wanted one more fight but I took too long a break after eating a granola bar and a protein bar in addition to drinking 2 bottles of water. 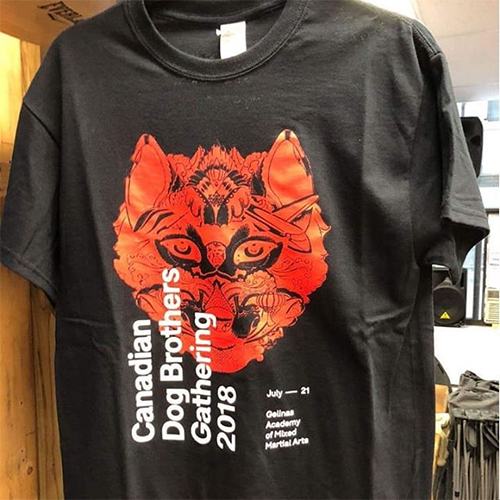 It was the 7th Canadian Dog Brothers Gathering so 7 fights would've been nice. Only 6 total fights though for a total time of 11.5 minutes between 11:00-3:30. My body is still achy all over after 2 days from only 11.5 mins of stickfighting! I thought he got 3 clean kills but after the fight he said he only got one, the other 2 were not deadly. He said I sliced his forearm with a clean hit. We have been online friends for a long time and glad we finally met! The day after the Gathering he taught a block of material that blew my mind. If you have a chance, go train with Wandering Dog! "Was great to meet and get the day started with you." We agreed to no knee shots and no grappling on the ground. He was recovering from an injury. He tried 2 spinning back kicks which missed ... on his 2nd kick I was able to hit his leg .... not hard but hard enough that IIRC he acknowledged it. He hit me quite a few times. He hits hard. Got me on my left elbow. He switched from his Dominant/right to his Complementary/left and I almost switched also. I fought with my Complementary Hand (Left). My Brother, "Dog" Chris, yelled at me, "It's your first Gathering. You are not left-handed. Switch to your right!" As it was my first Gathering, he felt I shouldn't have handicapped myself further especially against a Full Dog Brother who is a well-rounded martial artist and scary fighter. But I am proud I stuck to my Complementary Hand ... I was very close to switching to my Dominant Hand though! But I resisted the urge. Towards the end of the fight I was driving him into the cage and got him pinned and was going to try for a "cameltoe" takedown but the bell rang. @stickgrappler (huge respects to this man!!)" "@stickgrappler you were great! Fighting Full Dog Brothers right off the bat?? I knew I had to play tricks on you right away, I am humbled to be a part of your first Gathering. I will be down to NYC to train with you fine folks before the Open. As far as I am concerned, though, you're a proven StickFighter!!" I may have hit his hands a few times. I blocked with my head way too many times though LOL. He hit me with 1 rib shot and 2x on my forearms. He said I telegraphed. We didn't get a chance to chat about our fight. We have been online friends for a long time and glad we finally met. I have been training the Cavewoman series and it didn't manifest in this fight despite me using it in our training group sparring. Much to work on. "- Jack Lee, double stick, despite your self-deprecation, you showed good technique and power and took on a lot of heavy hitters for your first Gathering. (also, nice to finally meet you after some 20-odd vears of online discussion)"
62 yrs old, hip replacement last year and also Ascended to Full Dog Brother last year. We agreed to no grappling and no knee shots. HE HITS HARD EVEN THOUGH HE'S 62!!! Got hit in my head with his Caveman (diagonal slash down) from his Dominant/right hand. The first ever head shot where my head felt the hit! All other head shots I ever got I can hear I got hit but the mask took the hit and my head didn't feel those ... he hit me in my left elbow where I had bursitis a few years ago. Swollen now. Hit me on the ribs with nasty looking stick hickey that hurt a little but is nothing. At one point, he dropped one stick and I let him pick it up. We have been online friends for a long time and glad we finally met. "You were awesome my friend. Thanks for the fight." His 2nd Gathering ... nephew of Sage Dog. Forgot to say no knee shots to him prior to the fight ... he went 2x for my knee and I avoided except for the first where he hit me on my thigh. Stick hickey from thigh disappeared already. Lost my stick ... don't recall if he hit my hand, hit my stick hard or I just dropped. IIRC he said he hit my stick hard and I dropped it then. I clinched and pinned him vs cage as he repeatedly hit my head ... I tried to control his stick arm to no avail. After the fight he said he never fought a lefty before and that after his right dominant hand Caveman strike it was easy for a lefty to hit his forearm which I did (I was able to use "follow the force"). I told him that my Dominant hand is my right and I fought with my Complementary hand and he was surprised! After this fight on Saturday, Wandering Dog offered some words of advice which sounded cryptic at first. After Sunday's seminar in which he taught a block of material from his current martial arts research that he was reluctant to share initially, his advice from the previous day was crystal clear! "Thank you for the kind moves and also the fight. You made me have to adapt to your style. Thank you for the lesson"
It was late in the day, fewer and fewer Fighters were lining up. He was sitting down in the spectators section and was tired. On an earlier Facebook post of a mutual friend, he encouraged me to show up and that he would be honored to fight me. I asked him if he still had a fight left in him and despite being tired, he wanted to go with a technical fight with machete. Told him I'm a stick guy and I offered to fight a technical single stick fight. He said with sticks he didn't think it can be technical. He thought about it for a little and said ok ... we were the penultimate fight. Forgot to say no knee shots before we started and he kept going after my knee! I didn't think to hit his head as he went for my knee :( After the fight he said I was the only one he fought today to adapt mid-fight. I think his first drift shot grazed my thigh... then he went for more drift shots and I cross-stepped or 'elastico' back on those shots and avoided his knee shots. I really don't remember now how I was able to avoid his drift shots. All his previous fights of the day he landed his drift shots at the knee. At first I didn't know he was a Candidate Dog Brother and during dinner I looked up the Fighters List and found out... if I knew I may not have requested the fight ... LOL at me! "Glad I didn't hit you in the knee. Drift shots to the leg have been a huge part of my game these days. You're being modest and you did damn well. It was an honour to fight you and I hope to continue sharing growth with you." Due to my Family/financial situation with Princess Stickgrappler #1 in 2nd year of college, Princess SG #2 a junior in high school and SG Jr a high school freshman, I may not get to go to another Gathering to test myself until SG Jr is out of college in 7 yrs. I would be 60 then and may not fight at a Gathering at that age despite this Gathering having seen Tuhon Phil Gelinas aka Sled Dog, 65, a 63 yr old gentleman recovering from his stroke and fighting at his first Gathering and 62 yr old Sage Dog fighting. Nothing broken ... swollen elbow only. Nothing lost. Everything gained! MY DEEPEST GRATITUDE TO MY FRIENDS/OPPONENTS WHO TAUGHT ME WHAT I NEED TO CONTINUE TO WORK ON AND FOR MAKING MY FIRST GATHERING AN AWESOME EXPERIENCE! ALSO TO DEFENDER DOG AND THE REST OF THE DBMA NYC TRAINING GROUP FOR HELPING ME PREPARE FOR THIS! YOU ALL HELP AN OLD MAN REALIZE ONE OF HIS DREAMS! THANK YOU!! LAST BUT NOT LEAST MY SINCEREST AND DEEPEST GRATITUDE TO MY FAMILY FOR THEIR UNDERSTANDING AND LETTING ME GO DO SOMETHING CRAZY!! What a terrific write-up. I'm so happy that you got to challenge yourself with some skilled and respectful opponents.